Amazon and Microsoft today jointly announced that Alexa and Cortana will soon be able to communicate with each other. Microsoft said the collaboration will allow access to Alexa via Cortana on Windows 10 PCs later this year, and via the Cortana app for iOS and Android at an unspecified point in the future. Similarly, users will be able to access Cortana on Alexa-enabled devices like the Amazon Echo, Echo Dot, and Echo Show. iPhone users should eventually be able to open the Cortana app and say "hey Cortana, open Alexa," to access Amazon's virtual assistant. Alexa can be used to shop and manage orders on Amazon, ask a variety of questions, stream music and audiobooks, check the news and weather, and many other tasks. However, iPhone users won't be able to say "hey Cortana, open Alexa" from the Home screen, or when the device is locked. Apple only allows third-party virtual assistants to function within their apps, so accessing Alexa via Cortana will be a lot more cumbersome than simply using Siri. 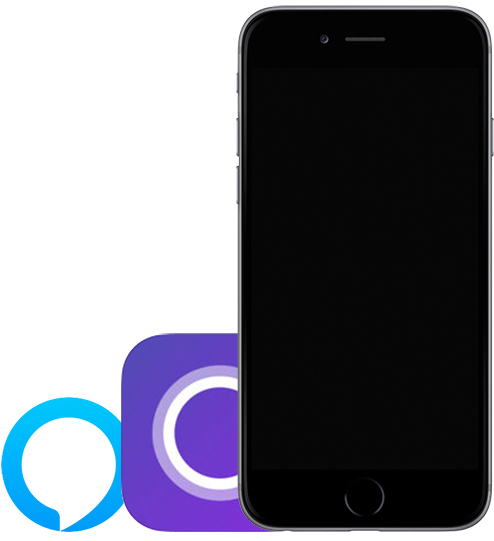 For a complete virtual assistant experience, iPhone users could also say "hey Siri, open the Cortana app" and then say "hey Cortana, open Alexa." Alexa can already be used in the Amazon app on iOS [Direct Link], while Cortana has been available on the App Store [Direct Link] since December 2015. For the first time, you'll actually be able to play the telephone game… with your phone. "Hey, Cortana, ask Alexa how the weather is going to be today." "Alexa, house heather knowing me to play?" "Hey Siri, open Cortana app and tell Alexa to start playing my lounge playlist on my Sonos in the living room." Heh. Coming this Fall to Apple Music TV: The Real HouseBots of Silicon Valley. So now we have a family of bots? Gives new meaning to the term "dysfunctional family." "Hey Siri, tell Cortana to open Alexa." OK I’m confused. Why do you need Cortana to access Alexa? If Alexa has to be accessed via an app why not an Alexa app? What am I missing? "For a complete virtual assistant experience, iPhone users could also say "hey Siri, open the Cortana app" and then say "hey Cortana, open Alexa."" They'll just spend all their time bitching.